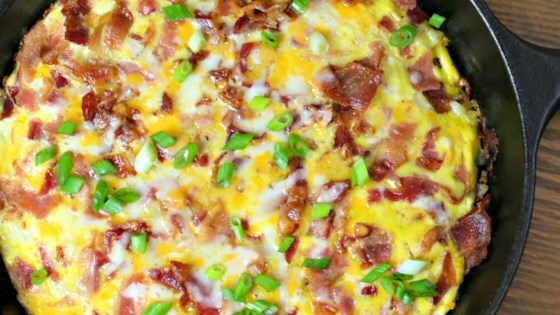 "Cheesy bacon-sausage-egg-hash brown skillet is a scrumptious, easy breakfast loaded with bacon, sausage, hash browns, cheese, and eggs! Garnish with 2 thinly sliced green onions, if desired." Place bacon in a 10-inch skillet and cook over medium heat, turning occasionally, until crisp, about 10 minutes. Use a slotted spoon to remove bacon to a paper towel-lined small bowl. Discard half the bacon fat using a spoon. Cook sausage in the hot skillet until browned on both sides, about 5 minutes. Remove to the bowl with the bacon. Heat canola oil and butter in the same skillet over medium heat. Add hash browns and onion. Sprinkle 1/2 teaspoon garlic powder, onion powder, 1/4 teaspoon salt, and 1/4 teaspoon black pepper on top and stir together. Spread out the hash browns; cook, without stirring, until browned, about 5 minutes. Turn hash browns over and sprinkle Cheddar cheese evenly over the top. Stir remaining garlic powder, eggs, and milk together in a bowl; season with salt and pepper. Pour egg mixture over the Cheddar cheese-covered hash browns in the skillet. Sprinkle bacon and sausage pieces on top. Bake in the preheated oven until top is puffed, cheese is melted, and a knife inserted into the center comes out clean, 10 to 15 minutes. This was very good for breakfast this morning. Had all ingredients on hand except sausage called for. Used Jimmy Dean breakfast sausage instead. I've never heard of or seen the sausage listed. This was a great breakfast recipe. I didn’t have bacon but I did have sausage and hash browns which contained bacon, onions, green pepper. Everything was tasty and delicious. So good - I'll make it again. I added a bit of garlic for a little extra! We loved this recipe. It was easy to make and very tasty. I especially loved the flavor of the sausage in the recipe. I will add extra sausage and bacon the next time I make it.